I plan to reach the summit of Snowdon and hope to complete this in about 3hrs! Come along, donate and enjoy! SIEVE MK continues to create opportunities to help young people in Milton Keynes overcome obstacles such as poor language skills, lack of role models, limited aspirations, and insufficient employability skills. 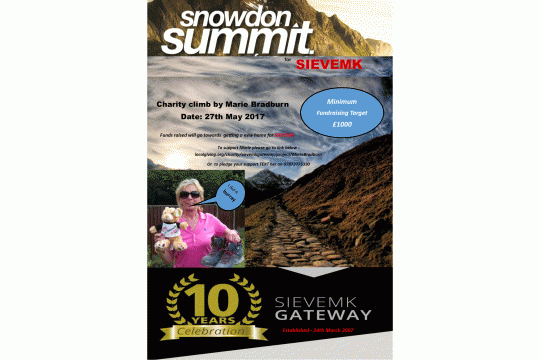 This year SIEVE MK turns TEN YEARS OLD and we are raising money for our building fund so we can move to our new permanent home! I plan and hope to raise at least £1000 by completing this challenge - so please donate today!